When Amazon announced the $199 Kindle Fire, it was the first time I was intrigued by a tablet other than the iPad. I'm a big fan of the Amazon value proposition and I was impressed with their focus on content consumption at a reasonable price. I didn't have any disillusions about the device being an iPad replacement. I had plans for it being two things: A kitchen counter web browser usable by everyone in the family -and- a replacement for our portable DVD player. But as it turns out the device doesn't provide a very satisfying web browsing experience and (due to the fragmented content marketplace) it's not a very good value as a portable video player. Leading up to the device's release there was a lot of information swirling around about which Android apps would be available on the device. By default, you purchase apps through a special section of the Amazon App store, and there are indeed a number of apps there. But as you push forward and attempt to make the Kindle Fire perform like your iPhone or even your iPod touch you start bumping into limitations. Read this article to get a sense for what it's like install non-approved Android apps on the device. Within an hour of opening the box I'm wandering around the web learning about .apk's, sideloading, and rooting. The fragmented app situation on the device is a total mess. 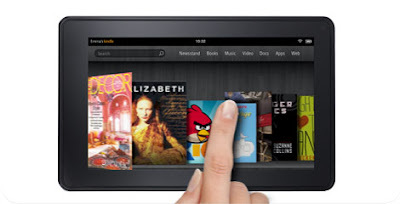 Amazon made a big deal about the "Silk" web browser when they announced the Kindle Fire. It was said to speed download times as it predicted where you were going to browse next. My complaint isn't so much with the time it takes pages to load as with the lousy overall experience of navigating web pages on the device. Often you have to tap on hyperlinks several times to be effective, Apple's brilliant "double-tap" to fit a column of text gesture is missing, and some pages don't function properly. I thought the larger screen size would enable the Fire to be a usable web browser, but on the contrary, the device is slightly worse than a 3 year old 2nd generation iPod touch - which has a much smaller screen - in terms of web browser usability. Browsing the web on an iPhone 4S is a much more pleasant experience than on the Kindle Fire due to the iPhone's speed, excellent page rendering, responsive touch screen and intuitive and effective gestures. Since web browsing was one of the primary things I was looking for in the device it's a big disappointment. I've never owned an e-ink Kindle, but so many people say they love theirs, I figured this device was a good time to get in on that experience. Unfortunately I'm not feeling the magic. I thought it was pretty nice that I could borrow "Moneyball" for free from the Amazon Lending Library with Amazon Prime, but I find the experience of reading on the Fire a little awkward given how heavy it is. Compared to an e-ink Kindle, the battery life of the Fire and lack of 3G connectivity is also a concern. I think I'd be better off getting an entry level Kindle e-reader - they start at $79 now. Next to the web browser this was my second area of interest and also a big disappointment. Video playback looks great and purchasing/renting content from Amazon is a breeze (if you know what you want, navigating the Amazon store for free content is still a bit of a morass in my experience). My beef is with the still-fragmented market for digital content. It's still often cheaper to buy a hard copy than it is to rent or buy. Take for example Rio. $8.99 to buy the DVD (free shipping with Prime) or $14.99 to buy the digital copy. Cars 2 isn't available for purchase - you have to rent it at $3.99 a pop. I see similar with books. I can guess why this is, but it doesn't make me any more enthusiastic about accepting it. Until it's more convenient and affordable to buy digital content it feels like digital just doesn't make sense yet. Ripping DVDs for playback on the device is also a complicated mess. After experimenting for a day with the best file format and resolution I still can't get a video to make use of the full screen. It's a total pain in the neck. The magazines I want to read (for example Wine Spectator) aren't available. I want a model where I pay one price for a subscription and I can consume it any way I want to. Print, online, on the go. I don't think this is any better elsewhere but it's certainly not good on the Fire. It's not so much that the Kindle Fire is a lousy product. It's that Apple spoiled us and Amazon is doing the best they can within the confines of the ecosystem they're operating within. It's been magical watching our kids intuitively navigate their way around the iPod touch and iPhone. The Kindle Fire has them peppering me with questions about why things don't work. "You've got to tap it a few times sometimes," says our 6 year old. The iPhone found the perfect intersection of being intuitive, looking gorgeous, and being immensely effective. About the only thing I like about it is the random high resolution images that greet you after waking the device. Unfortunately, the novelty wears off as soon as you swipe your finger across the device and you're reminded of the laggy, herky jerky responsiveness you experienced last time you touched it. My experience playing with the device the past few days has made me appreciate what a breakthough device the first iPhone was. And what an amazing device the iPhone 4S is. The core interface of the iPhone hasn't changed much since it was released - it's just gotten better and better. Will Amazon be able to pull the same trick? Release a valiant 1.0 and continually improve it through software updates? We'll see, but I don't think I'm going to be along for the ride. Did you try to root it at all? I was wondering if it was easier to get video going that way. It wasn't worth the hassle to me, I've been spoiled by the iPad. I didn't try rooting it. I've already done more tinkering with the Fire the past few days than I've done in the past 4 years with iPod touches and iPhones. I'm with you. Bring on the $299 7" 8GB iPad and I'm a buyer. Indeed, but Fire is the most comfortable tablet for reading, emails, reading, and audio books. Among all the kindle unit they've produced, I guess the kindle fire has received a lot of good reviews from various gadget aficionados. Can't blame them, me myself liked the new features of it. Amazon make a great job in here for reading e book. My vote for kindle fire but,the iPhone found the perfect intersection of being intuitive, looking gorgeous, and being immensely effective. I should definitely do this. My daughter has so many toys! and although a lot of them are in the basement so she doesn't play with them everyday there are still a lot of toys upstairs and by the end of most days she can barely walk in the living room! There are still individuals out there who would prefer not to possess a cellular telephone. They would prefer not to pay for a remote telephone plan. For those individuals, a prepaid mobile phone is the ideal blessing. They can utilize the telephone as a part of crises just. With a prepaid wireless, you don't get a month to month bill and you don't need to sign any agreement.